Wealth doesn’t come from the creation of money, especially a fiat system. With too much fiat money and all this credit, eventually the economy becomes exhausted and engulfed with debt and mal-investments. The treatment for this is a correction; you have to allow the debt to be liquidated. You have to get rid of the mal-investment and you have and to allow real economic growth to start all over again. But that wasn’t permitted in ’08 and ’09, which is why there’s been stagnation. It’s hard to believe that today we have negative interest rates — real rates are negative and people still aren’t grabbing them up! A shortage of money isn’t the problem here; rather, it’s a shortage of understanding market conditions. We’re over-taxed and over-regulated. This is resulting in a destructive system that has divided the country into two groups: those who haven’t recovered from the Great Financial Crisis versus those who are getting very rich because they’re on the receiving end of the new money created by the Federal Reserve. The people who get to create the credit get to distribute the credit, which always results in a situation where money becomes unfairly distributed, as its allocation is no longer dependent on productivity. We haven’t changed anything. We still have a system where we encourage people to borrow money, that debt doesn’t matter, and we’re not going to cut taxes, and we’re not even going to admit that we spend too much money. Nobody can cut anything — that’s why Washington is at a stalemate. A lot of people don’t like Obamacare, but there’s enough people who do like it. Once it has been implemented, it’s very hard to get rid of a program. I also don’t think that the proposed tax reforms will actually lower taxes. They never do. Our politicians won’t admit where the real problem lies: overspending, monetizing the debt, taking over the whole world through the monetary system, financing wars, financing welfare and the military industrial complex. It’s going to continue until this whole thing comes apart. The eventual event will be driven by the marketplace. When it comes undone, they will no longer be able to prop things up just by printing more money. If we have a sharp downturn and they decide, “Well, QE didn’t work because it wasn’t enough.” and they double QE, there’ll be a point of no return and all confidence will be lost. We’ll dump the dollar. Interest rates will go up instead of down. That will make all the difference in the world because it will be unsustainable and create real challenges for the dollar remaining the reserve currency. When the dollar no longer serves as the world’s key currency, that’s when the ballgame will be over. 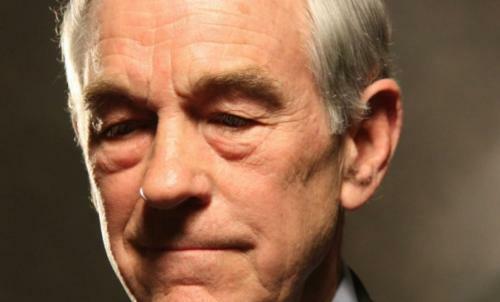 Click the play button below to listen to Chris’ interview with Dr. Ron Paul (29m:56s). This article was posted in Civil Liberties, Economic Collapse, Economy, Headline News, Interview, money, Ron Paul, wealth gap, wealth inequality and tagged Federal Reserve, Fiat. Bookmark the permalink. Follow comments with the RSS feed for this post.Comments are closed, but you can leave a trackback: Trackback URL.